Posted on April 24, 2010	by भरत ! There is perhaps no other symbol that captures the imagination of a nation more than a national anthem. The two most famous songs which celebrate the Indian nation and which have vied with each other for the status of our national anthem are Vande Mataram and Jana Gana Mana. 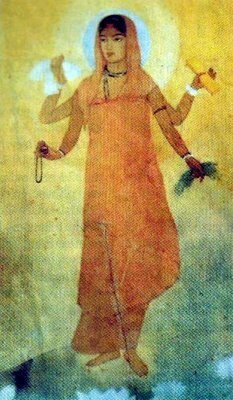 Vande Mataram is, of course, the older of the two and takes the form of a worshipful hymn to Mother India. It was published in Bankim Chandra Chattopadhyaya’s novel Anand Math in 1882, the concept of Vande Mataram came to Bankimchandra Chattopadhyay when he was still a government official under the British Raj, around 1876. It was translated into Marathi and Kannada in 1897, Gujarati in 1901, Tamil in 1905, Hindi in 1906, Telugu in 1907 and Malayalam in 1909. By the 1920s, it had become widely known as the national song of India. The first political occasion on which it was sung, was at the 1896 session of the Indian National Congress. It was set to music by none other than Rabindranath Tagore. It gathered mass appeal during the anti-partition movement in Bengal and was sung during the Bengal Provincial Conference held at Barisal in April, 1906 under the presidentship of a Muslim leader. It was, later, sung by Tagore himself on the opening day of the Congress session. In due course, Vande Mataram” became national cry for freedom from British rule during the freedom movement. Large rallies, fermenting initially in Bengal, in the major metropolis of Calcutta, would work themselves up into a patriotic fervour by shouting the slogan “Vande Mataram”, or “Hail to the Mother(land)!”. The British, fearful of the potential danger of an incited Indian populace, at one point banned the utterance of the motto in public forums, and imprisoned many freedom fighters for disobeying the proscription. the title of the song became the slogan of our nationalist movement. Lala Lajpat Rai started a journal called Vande Mataram from Lahore. Hiralal Sen made India’s first political film in 1905 which ended with the chant. Matangini Hazra’s last words as she was shot to death by the Crown police were Vande Mataram. In 1907, Bhikaiji Cama (1861-1936) created the first version of India’s national flag (the Tiranga) in Stuttgart, Germany, in 1907. It had Vande Mataram written on it in the middle band. although there were occasional protests from some sections of the Muslim community who protested that the song had communal overtones. Thus, between the years 1915 and 1947, intermittent voices were raised by some sections that certain references in the song are offensive to Muslim sensibility. This inevitably led to widespread resentment and acrimony and polarised communal sentiments among several disparate groups. Translation of Vande Matram In Hindi. It may be seen that the first two stanzas except for the reference to the country as Mother, the hymn does not contain any symbol or imagery which might affect communal sentiments. 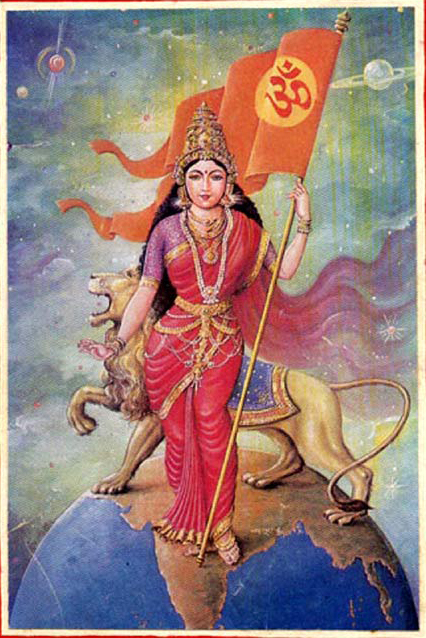 However, the next stanza equates the motherland as a goddess to be worshipped in a temple, in fact, evoking Durga, the destroyer of enemies, holding her ten weapons of war. It is pertinent to mention at this stage that in the time of Bankimchandra, Bengal was under the rule of a Mughal Governor and the novel Ananda Math, which is the vehicle used by the author to launch this hymn, is a story based on the militant revolutionary activities of a group of Hindus in the background of the Sanyasi rebellion. In this view of the matter, the hymn attacked the Muslim rule of the day and, in the larger context, it was a battle cry for a resurgent Hindu India while challenging the British imperialist rule. With the emergence of the Muslim League and the Hindu Mahasabha in the first two decades of the 20th century, communal sentiments became polarized. Between 1922 and 1927, there are official records of at least 112 incidents of riot and bloodshed which were precipitated by Hindu-Muslim conflicts in which Vande Mataram had some direct connection. Tagore’s Jana Gana Mana was chosen as the National Anthem of the 1947 Republic of India. 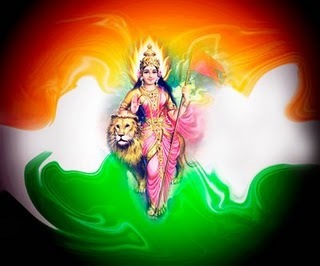 Vande Mataram was rejected on the grounds that Muslims, Christians, Parsis, Sikhs, Arya Samajis and others who opposed idol worship felt offended by its depiction of the nation as “Mother Durga”, a Hindu goddess. Muslims also felt that its origin as part of Anandamatha, a novel they felt had an anti-Muslim message. Alluding to the event that led to the choice of Jana Gana Mana as the national anthem, Nehru has stated in Parliament, “The matter came to a head on the occasion of the General Assembly of the United Nations in 1947 in New York. Our delegation was asked for our national anthem to be played on a particular occasion. The delegation possessed a record of Jana Gana Mana and they gave this to the orchestra to practise. When they played it before a large gathering, it was greatly appreciated and representatives of many nations asked for the musical score of this new tune which struck them as distinctive and dignified. Muslim institutions in general, see Vande Mataram in a negative light. Though a number of Muslim organizations and individuals have opposed Vande Mataram being used as a “national song” of India, citing many religious reasons, some Muslim personalities have admired and even praised Vande Mataram as the “National Song of India” . Arif Mohammed Khan, a former Union Minister in the Rajiv Gandhi government, wrote an Urdu translation of Vande Mataram which starts as Tasleemat, maan tasleemat. Shiromani Gurudwara Parbandhak Committee or SGPC, the paramount representative body in the Sikh Panth, requested the Sikhs to not sing “Vande Mataram” in the schools and institutions on its centenary on Sept 7, 2006. SGPC head, Avtar Singh Makkar, expressed concern that “imposing a song that reflected just one religion was bound to hurt the sentiments of the Muslims, Sikhs, Christians and other religious minorities. The DSGMC (Delhi Sikh Gurudwara Management Committee) has called singing of “Vande Mataram” against Sikh tenents as the Sikhs sought “sarbat da bhala” (universal welfare) and did not believe in “devi and devta”. DSGMC head H. S. Sarna also added that the song “Vande Mataram” had been rejected long by well known freedom fighter Sikhs like Baba Kharak Singh and Master Tara Singh. Fr. Cyprian Kullu from Jharkhand stated in an interview with AsiaNews: “The song is a part of our history and national festivity and religion should not be dragged into such mundane things. The Vande Mataram is simply a national song without any connotation that could violate the tenets of any religion.” However, some Christian institutions such as Our Lady of Fatima Convent School in Patiala did not sing the song on its 100th anniversary as mandated by the state. Christians make a distinction between “veneration” and “worship,” and even though the song falls into neither of these categories, some Christians may have declined to sing the national song because of their understanding of its intention and content. This entry was posted in India and tagged against, anandmath, bankim chandra chatterjee, bharat, british, in hindi, india, lyrics, meaning, national anthem, national song, vande matram. Bookmark the permalink.